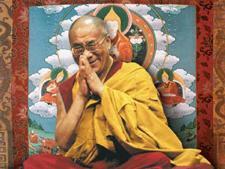 Pune, Maharashtra, India – Late yesterday morning, His Holiness the Dalai Lama flew across Central India from Gaya to Pune. He was received at Pune Airport by representatives of MAEER’s MIT and the National Teachers Congress, who were hosting his visit, as well as members of the local Tibetan community. This morning, prior to leaving for the main event, His Holiness met with more than 130 members of the Tibetan community in Pune—students, shopkeepers and some professionals. In his talk to them he touched on the need to study Tibetan. He explained that Tibetan is the language in which Buddhism, particularly of the Nalanda Tradition, can be explained most accurately. He brought them up to date on the political situation with regard to Tibet stressing that things are changing in China. He assured them that he remains hopeful things will change for the better. 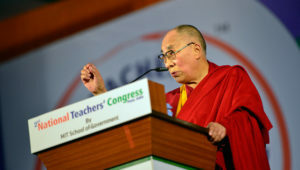 At the campus of Maeer Mit World Peace University, His Holiness was ushered into the main marquee for the inauguration of the 2nd National Teacher’s Congress. After a classical dance performance and the screening of a short film on what had been achieved at the 1st National Teacher’s Conference, His Holiness and other guests were invited to ring an education bell before taking their seats on the stage. After a short welcome speech by Mukta Tilak the Mayor of Pune, Rahul Karad, the Executive President of MAEER MIT World Peace University, and main organizer of the Congress, welcomed teachers from all over India, and several from abroad, who had come to take part. Dr. Anil Kakodkar, Founding Patron of the National Teacher’s Congress and an eminent Indian scientist offered remarks on education. His Holiness began his address by emphasizing the need for compassion in today’s increasingly troubled world. Many of the man-made problems we face, he said, are due to an emotional crisis that we see taking place across the world. He pointed out that medical scientists have observed that anger is clearly detrimental for our health and well-being. His Holiness remarked that when what we think of as modern education began to emerge in the West, moral values were still the province of the church. Nowadays, modern education focuses primarily on physical development and material goals, while the influence of the church has declined. Consequently, ethics are neglected. As the inaugural ceremony came to an end, His Holiness was invited to present the Jeevan Gaurav Puraskar Awards to four people who have made an outstanding contribution to education.